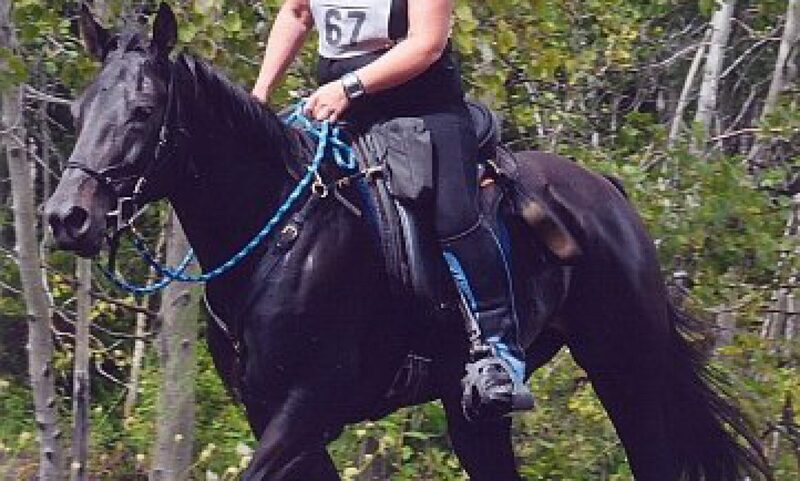 One of the very first rides that I took King to was called the Thames River Valley Ride. Now, I can be a bit thick sometimes, but really this was not one of my more stellar moments – because it somehow never occurred to me (even given the watery hints in the ride name), that we might have to cross water. A few miles down the trail, we came around a corner and discovered a rocky creek across the trail. It wasn’t wide, or deep. But the footing was a bit scary looking. I had no clue if King would cross. I asked the woman riding with me if her (older) horse crossed water. She had no idea, but asked him to go forward. But, he refused quite adamantly. So I held my breath and asked King to step forward and look at the water. Luckily, it turned out that King liked water a lot. He had a drink and then picked his way through carefully, but quite confidently. And since that first day, King has always been happy to ford streams, rivers, and wade into lakes. But really that was just sheer luck, and I knew it. He could just as easily been that horse next to us who refused. I felt quite stupid about it, and from then on have tried to expose King to as much as possible at home, so he is not exposed to things for the first time at a competition. It’s a really good discussion on exposing your horse to the actual conditions you might encounter at a competition, before you get to the competition. Cold, wind, rain, mud, etc. I’ve been feeling very guilty for not riding much over the last couple of weeks. The footing looked kind of yucky, and I just didn’t feel too motivated. So today I yanked up my bootstraps and took King across the road, figuring that we could just go slow and be careful in any slippery or soggy spots. Well, yuck. Ugh. And double yuck. The footing is horrible. It alternates between sheets of wet, slippery ice, and bogs of wet, sucking muck. With the additional treat of some pretty deep run-off water washing across the trail in a few spots. I guess my procrastination was valid. No riding for a few more days. I am really itching to get going with King. He was coming along so well after working through all the snow this winter. I could feel how much stronger he was getting. Now we’re at a total standstill. I probably ought to get a load of sand put in my round pen, so I could at least do some schooling in there during mud season. Even the footing in there is impossible. The soil around here is heavy clay. The weather is absolutely foul here today. It’s snowing heavily, and the wind is fierce. It’s not all that cold, and this is all supposed to turn to pouring rain this evening and then rain steadily for a couple of days. King and Zamaluck are both in stalls, and Dressy and Diego are keeping to the run in area at the end of the barn. It would be nice if it would melt all the snow. But if history is any guide, it’ll just get all the snow soggy, and then freeze to sheet ice. Then there will be no riding for another week or two. I am waiting very impatiently for spring to arrive, so I can get on with conditioning King and I for the ride season. He’s really ready to go out and put some miles on after all the snow wading we’ve been doing this winter. Meanwhile, at work, we are awaiting the arrival of three new foals this year. The three broodmares are Exclusive, Bernice, and Freckles. They are all looking quite large. But Freckles is just enormous. The poor mare has got to be very uncomfortable. I told her owner that perhaps breeding her to a stallion with “Megas” in his name was not such a good idea. The last baby she had was by a perfectly normal sized stallion and the baby ended up being called “Monster” because he was so big when he was born. Bernice is pregnant with her second foal (and wasn’t in foal last year), so she’s been off the track for a few years now. You’d think she’d have gotten fat and lazy. But every morning I take her out to the paddock, with her snorting and blowing beside me. Then she cavorts around the paddock, doing pirouettes and other unnameable things in perfect, impossible balance, defying the laws of physics. Looks like her feet aren’t even touching the ground. I guess I should take some video of her. I’ve started taking my camera with me to work every day. Soon there will be baby pictures! It’s been a long, rocky road turning King into a civilized being. Much of it was really just my own damn fault. I wasn’t fit enough to ride a smart, opinionated, extremely energetic young horse back when I was breaking him to saddle. He learned that he could drop me into the closest shrubbery whenever I asked too much of him. But we’ve mostly worked through all that. I’ve developed more sticking power over the years, and considerably more nerve. And he’s developed some manners most of the time. But today, he reminded me that he’s still got that same personality he always had, bubbling away under the surface. I took him out for a short ride around the farm. It’s about a 3-4 mile loop. The snow is still pretty deep and it’s fairly crummy footing. There is some ice under the snow, and although it’s not actually slippery, it makes the footing quite uneven in addition to being heavy. I asked him to trot along in a few nice level sections that were well packed down. He figured that was an invitation to careen wildly. We had some discussions about what was trot and what was canter (amazing how often he confuses the two). And then we had a discussion about whether bucking was civilized good horse behaviour. Likewise galloping sideways through deep snow. And finally… up a very VERY steep hill bolting flat out. I have to say that I think the devil enjoyed it all thoroughly. His ears were forward and he snorted happily throughout all the antics. He’s definitely lost some weight with all this winter riding, which is awesome. He’s usually sort of seal-shaped at this time of year. After today’s ride, he got damp with sweat, and it flattened out his winter coat. I could actually see individual muscle definition in his hind end, and the belly is just barely starting to tuck up. Which is not to say that anyone else looking at him would think “thin” mind you. He is still kind of an Arab in a Percheron body. But now he looks like a fit Percheron anyway! This was taken right after Christmas when the snow was a really nice consistency and the footing was perfect. The camera is a helmet cam with some anti vibration technology built in. It’s not so great in the flat white light of winter/snow. But I think it’ll be a lot of fun to take it to competitions in the spring.